As I get older I realize why my grandmother was so self-conscious about her hands she would just look at them with this sad sigh of regret and embarrassment. She hated the way they looked as she got older and now I can relate. My Ayurveda teacher, Mary Thompson once said, “That’s really one way to tell how old someone is, by their veins showing through on their hands. When we are young there is a softness and plumpness, that is really hard to capture as we age.” I know it’s totally depressing, I heard this as a 38-year-old woman so, just saying I understand. So yes we can all get together and pity ourselves for having to deal with the inevitable or we can just focus on maintenance and health of the skin, and just be in a state of letting go and acceptance of the process of aging. Which by the way makes our faces look a lot better because we are relaxed and happy. Instead of the alternative stress filled intensity that can happen when we live in a state of trying to control things that cannot be controlled. Because in reality, nothing is under our control, so better to accept it now so you can live in the rhythm of life. It’s a lot more fun on this side, trust me. Even as a did some internet research for this blog the cruel reality of how women are judged on everything including how their hands’ age if you are celebrity wear gloves because there are apparently spies out there taking photos of your hands trying to see how you measure up. I would like to note I saw no images of male celebrity hands, just saying. I was also surprised to find that now you can inject your hands with chemicals to make them appear younger. Not sure how I feel about this, because to me beauty and health are connected and doing something that could have health risks down the road defeats the purpose of creating true vitality. We need to move our culture away from media influenced conditioned beauty to balance in the body and mind, of our system and recognize this is beauty. And in fact, this is so beautiful attaining health and peace in our minds and bodies and we need to lay off the judgment of our sisters, especially. This is not a healthy approach to aging, and we are being predicated upon, and it needs to stop for our mental well being. So my first advice is not to listen to this negativity and to move into a state of acceptance and non-judgment of yourself and others. Can you feel the Peace happening, because it starts here my friends. These are the day to day things that help us attain everlasting beauty which is tied to the health of your skin if the texture is soft, hydrated and balanced then you’re doing just fine. Drink H2o, I mean I know you’ve heard it but maybe some of you need to hear it again. No sugary drinks, no need to dehydrate yourself while you’re supposed to hydrating and cause insulin spikes unnecessarily. Eat a plant-based organic diet and intake of healthy fats on the regular like avocado, olive oil, coconut oil, walnuts, olives, sunflower seeds, chia seeds, dark chocolate. I like to get my fats from plant sources, I think everyone knows how I feel about plants so this comes I’m sure as no surprise. Ridding our environment of toxic products containing synthetic aromas and chemicals. The tremendous amount of chemicals in our commercial laundry detergent, makeup, skincare, cleaning products is criminal. It all has to go they deregulate our system ultimately creating an imbalance of our immune system. The link between the number of chemicals we are taking in on our person and the influx of autoimmune disorders is undeniable. Major detox of all things toxic is paramount to maintaining our health. Intake of herbs especially adaptogens is the essence of vitality. As the body ages, it has a decrease in its adaptive capacity needed to maintain homeostasis when under stress. When this cannot be maintained, physical, emotional, and mental health declines. Adaptogens have the ability to slow the biological aging process by reducing the impact of physiological aging factors, primarily stress and oxidation. Way better than injecting your hands with synthetic chemicals because you’re receiving an all-around benefit to the body and mind. Use Botanical skincare because this is just a medicinal treasure trove of plant powers. When we look at a skincare product we need to open our eyes to the labyrinth of healing in the matrix of just one plant not mention when it’s formulated with other healers. Because that’s what they are healers, containing the essence of nature herself in all her glory and goodness. The stabilizers of health and the more we can access them the better we feel. It’s the transfer of nature into your body and mind, this is what it’s all about. This is where it’s at, and this is how we find health. I use PREMO hand + nail + foot treatment daily because I live in Colorado it’s unforgiving when it comes to exposure to the elements, but even when visiting major cities I can feel the oxidation happening, free radicals all over the place. I like the protection it offers and the fact that it contains CBD hemp extract is also a plus. 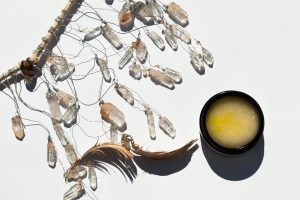 I could write a thousand blogs on CBD and its benefits. But I feel it comes from an adaptogenic plant, with over 480 known constituents and counting. So for people who use their hands a lot or who may be experiencing joint pain from consistent use, this is ideal. I notice the difference when I use it and when I don’t my hands actually physically look different. Before I close out this blog, I want to mention that we have a great deal of focus on the physical look of things instead of how we feel in our own bodies. As we grow older things will change due to inevitable inescapable time, but we can manage our health and the balance of our bodies and mind to age with grace and harmony with nature. You have the control and power of choice, and these little choices big and small are what contain the totality of how well we will remain healthy as time moves on. previous post: THE OTHER PARTS: Spotlight on LIPS Do we need special treatment for these sometimes neglected parts?